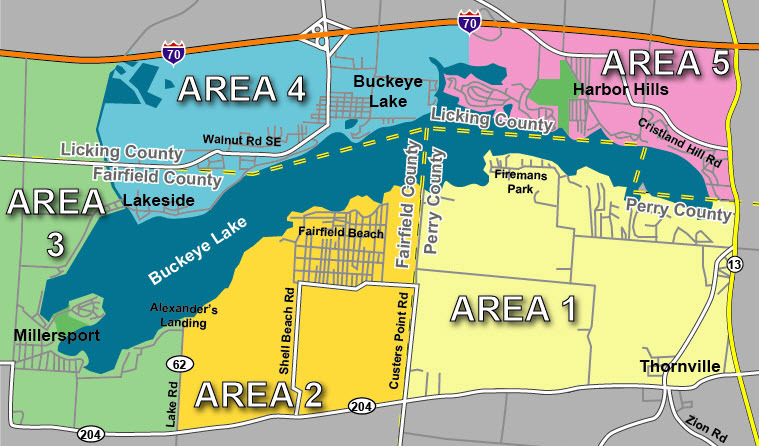 Area 1: Perry County Line West, Route 13 East, Route 204 South & Edgewater Beach — Thornville, Thorn Twp., & Edgewater Beach. Area 2: County Rd. 62 Alexander’s Landing West, Perry County Line East, 204 South — Fairfield Beach & Walnut Township. Area 3: County Rd. 62 Alexander’s Landing East, Route 317 West, 204 South, I-70 Millersport — West Bank & Liebs Island. Area 5: Center of Maple Bay West, Rt. 13 East, I-70 North, Excluding Edgewater Beach — Harbor Hills & Avondale.